The small cluster of apartments are situated in a perfect location within walking distance of old town and new town with several excellent bars, clubs and restaurants in the immediate area.Security is very good but steel bars on ground floor apts are offputting. Staff are very pleasant and helpful,from maids to the manager.However, even though they are superb when there,reception is very limited and it can be hard to locate someone when you need them.We had no problem getting second keys and they were happy to provide large containers of water and deliver them to your door. The entire block is kept very clean but apartments are a bit dated and would clearly benefit from redecoration and the pool is small and not acclimatised. Outside the gate there is a snackbar which seems to be part of the complex but we didn't try it. Food and entertainment are never an issue as there is no point whatsoever when you have the main Puerto del Carmen strip right outside the gate and beach right across the road (the best part of the beach is 300 meters to the right. I would recommend it to couples and singles as a basic but perfectly located apartment complex but not somewhere I would take my children as it is not set up to cater for their needs. Myself and my husband escaped without the children and really enjoyed our stay at the Flamingo Apartments. We have a fantastic seaview from our balcony. Just outside the gate was an abundance of bars, restaurants etc. Just across the road from Cocktail Bar, two supermarkets nearby, beautiful beach walk. Would definitely stay in these apartments again but would not recommend for families. Apartments were cleaned regularly. Limited reception. Had problem with shower one morning and within 5 minutes workman had arrived to fix the problem. Great apartments for couples. The rooms was stinking, the maids cleaned the flowers with the water from the kids pool! And there seems to be one apartment in the complex that is infested with cockroaches that they do nothing about, especially with it being a 2 bedroom apt for families! All the other apartments seemed fine. Location is OK, a bit far away from the old town for my liking. Was described as nice family hotel, kids pool was great and was enjoying it OK until a group of 15 friends turned up to stay, were loud, drank all day, broke bottles beside the pool and had no regard for the kids or people around them - caught them stealing my kids toys to play with in the big pool! Just got back from these apartments and had to write a bit to give them a mention as no one had yet. Perfect!! They actually looked much better than the brochure picture which is unusual. From my apartment I even had a sea view! The apartments were basic, clean and had everything you needed. Good points - Clean, quiet, freindly staff, good for children, safe gated pool area, perfect location. Bad points - Hard bed, hot and cold shower water(never had one complete shower where I didn't swear with the sudden downpour of freezing water), only one key per apartment, even the two bedded ones, freezing pool. Every person had trouble getting out the gates to start with, had a knack to opening them. These apartments seemed to please everybody that was there at the time, never heard any complaints. As there is just 22 apatments there is always room around the pool on sunloungers, there is also a pool table. I have to say the location was the best, walking around the resort I never saw anywhere that seemed more ideal to stay. You are basically across the road from the sea. You are very central and are a few steps away from shops, resturants, bars. It is still quiet though as it sits back a bit with a car rental place at the front. I would definately go back and would recommend them to anyone wishing a basic, clean and friendly place to stay that is the perfect location. I would say that it is ideal for couples, families or singles. The hotel was really nice, the pool was quite small, but we weren't bothered. We didn't see any staff members throughout our stay, except the manager who was always fixing things. 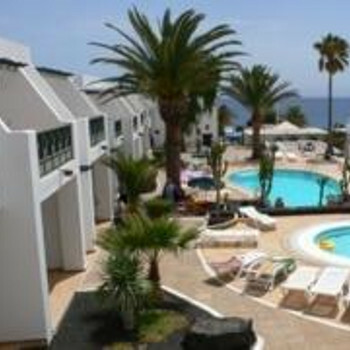 The hotel was only 10 minutes away from bars, clubs and restaurants, and also the shops, and five minutes to the beach. There wasn't any entertainment at all. Given all that I would still visit again as it's in the perfect location if you want to relax. We stayed here allocation on arrival and were more than pleased with what we got. The apartment was a reasonable size, cleaned daily, no cockroaches or anything.our good man pedro cleaned the pool EVERY morning and there was a wee snack bar next to the front gate. About a 10 min walk from the main bars/clubs which was fine, directly across the road from the beach, although the main beach was prob a 10 min walk again. Prob not the best for couples coz there were lots of kids when we stayed. I have very fond memories of staying here and would def recomend it!